When you visit Halton Honda for service, you can be confident that you’ll be looked after by our courteous service advisors and Honda-trained Technicians. Our team is committed to providing you with convenient, competitive, worry-free service. After all, no one knows your Honda better than a Halton Honda Dealer. We are proud to be supported by Honda ETecH: a giant leap forward in automotive service capability. ETecH was designed by Honda Canada’s Technical Tools department to help improve service capability for the Canadian Honda and Acura dealer network. ETecH is a server-based system, accessed by technicians through a rugged, fully mobile tablet PC. Each server runs virtualization software, capable of hosting multiple sessions of Windows and Linux operating systems: a session for each technician using ETecH. With this system, each technician has instant, mobile access to the critical tools and information they need to service your vehicle in a modern repair environment. This includes access to diagnostic and control module update software, service publications and bulletins, and the dealer’s own management system. The system’s architecture reflects Honda’s ground-up thinking that enables our technician to work without barriers. The technology found in today’s vehicles is constantly evolving, creating the need for frequently updated service publications, diagnostic software, and vehicle software. All Honda technicians have unrestricted access to service publications. They are also equipped with a wireless tablet device that ensures fast and unimpeded access to new information the minute it’s published through ETecH, a server-based system designed to improve service capability for the Canadian Honda dealer network. This device provides Honda technicians with the confidence of knowing they have the very latest service tools and information on hand at all times. (A) Electronic: What makes Honda technical training unique? Honda technicians are kept abreast of the latest evolving technology through distance training programs available through e-Learning. E-Learning allows for timely and on-going training as soon as new models and technology are introduced, and is customized for each associate, with interactive functionality. (B) Classroom: Honda technicians also participate in special technical training courses where they are challenged to demonstrate both their knowledge and their tactile skills. Hands-on training ensures that Honda technicians are able to stay up to date on technological changes and service procedures. At Honda, “good-enough” is not good enough. Students cannot pass a technical training course by simply listening to a lecture and writing a paper test. A special form of training is used. It is referred to as IST (Individualized Skills Training). What makes IST training so special? Class size is restricted to no more than 8 students and participants work at their own pace. Every student must demonstrate the skills required before they receive credit for the course. Lectures & tests (passive learning) have been replaced by skill acquisition and skills demonstration (active learning). Through this process, we are able to guarantee that students have acquired the knowledge and demonstrated the skills needed to fix your vehicle right the first time. Technicians are not the only staff members required to complete Honda training. Service Advisors, Fixed Operations Managers, Parts Managers and Parts Advisors complete more than 25 online and in-classroom courses to ensure your Honda is running in optimal condition. ETecH facilitates technical support from Honda Canada with specialists available to troubleshoot difficult problems in real-time. ETecH provides the means to remotely control sessions and diagnostic functions, while working directly with technicians to complete the repair. Diagnostic data is also transmitted for immediate analysis to help work through a problem while the vehicle is at the dealership. Today’s advanced vehicles have systems that facilitate software updating in the field. When needed, CM Update (Control Module Update) software provides a means of servicing these systems at the dealership. Certain owner concerns and vehicle issues can be effectively resolved by updates in the form of software revisions. 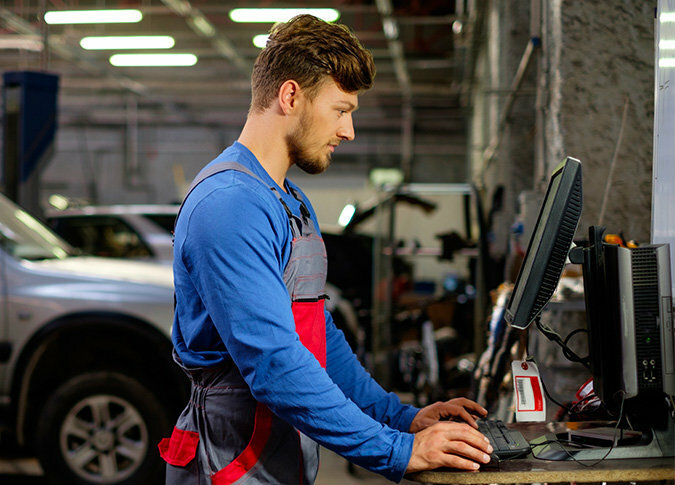 With ETecH, your vehicle’s software can be updated over a wireless connection while other service work is being performed. Halton Honda has state of the art facilities, with customer comfort in mind. Make an appointment today and enjoy our comfortable waiting lounge areas with complimentary coffee and Wi-Fi internet access. You can easily schedule an appointment. Making an appointment online or by phone is easy and convenient. You can book with confidence, knowing that your vehicle will be in the trusted hands of Honda trained technicians who use only Genuine Honda parts. When you think maintenance, think of Halton Honda dealer.